It’s that time of year when everyone makes New Year resolutions, like losing weight or at least attempt to do something that will make them healthier. I don’t do resolutions, but I do set goals. One of my goals for 2016 is to be more active. As you know, it’s easy to start an exercise routine, it’s sticking with it and making it a lifestyle change, that’s hard. Staying active is my goal this year. I’ve been thinking about why I don’t always stick to exercising regularly and I think it’s the same for many women… because it’s not just about getting active, but “staying” active. If you let bladder leaks keep you from staying active, I’m here to tell you, don’t. Depend has you covered. But they have you covered discreetly. Seriously, they are yoga pants approved. I understand the insecurities LBL can cause, but Depend will help you live a life uninterrupted, an active life. The life you deserve. Depend Active Fit Briefs really will give you the confidence you need for staying active. I wanted to try Depend Silhouette Active Fit Briefs for myself and to see if they were really yoga pants approved. I stopped by Walmart to pick up a box of Depend Active Fit Briefs, which comes in a box of 12 briefs (8 beige and 4 black) for $11.97. Let me tell you… if you think of an undergarment that protects you from bladder leakage as adult diapers, get that idea out of your head. These are not your mother’s Depend. These active briefs are nothing like an adult diaper. They’re very light and comfortable and no one will know you’re wearing them unless you tell you them. I took the #yogapantchallenge and my husband who was a few feet away taking the photos for me, could not tell when I had them on, and I am wearing compression yoga capri pants in the photos below. Now that’s a great test. I’ll update this post later with the answer, but for now, I’d love for you to leave a comment telling me which photo you think I’m wearing them in. Can you tell which pic of my bum I’m wearing Depend Active Fit Briefs in? I don’t typically share photos of my backside, but since this is for a good cause, I’m taking one for the team, ladies. 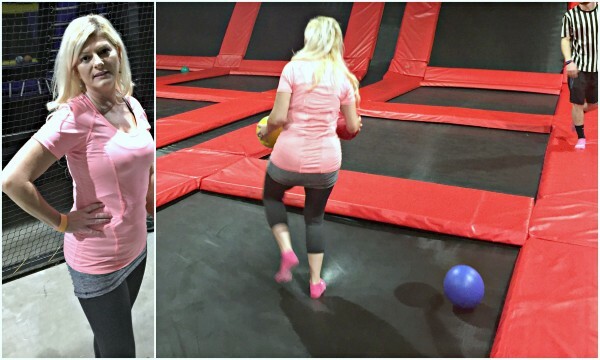 Image on left is me getting ready to go in the dodge ball pit to take down some kids. Image on the left doesn’t show the guilty innocent boys. I don’t even mind going to the trampoline park and kicking some middle school kids at playing dodge ball with a bunch of middle school kids. Without a doubt you can live a life uninterrupted with Depend Active Fit Briefs and get rid of your insecurities forever. Enter on the form below for a chance to win one of forty (40) activewear gift sets. Good luck! It is very hard to tell the difference. I guess 1 is with, 2 without. You definitely can’t tell 🙂 glad you found something that works for you. Those look great. I don’t have leakage issues yet, but I’ve had more than one child, and I know my chances of developing leakage are greater as I get older. Wow, I’m really impressed. I honestly can’t tell which photo you’re wearing them in! Cute workout pants by the way! That’s hard to tell! Maybe photo 1 is with? I truly can’t tell which one you are wearing them in them. That is awesome. I love that you incorporated a yoga pant challenge because if you can’t see the briefs that way, you are definitely safe and secure. So glad to know there is a solution for this common problem. I haven’t had to use Depends but I am glad it is there to help those who need it. Right now I don’t have a need for these products, but I am glad they exist for people who do. I can’t tell from the photos which is which! I can’t tell which photo. I love that this product alllows one to stay active without feeling self conscious. I really can’t tell the difference. Lol glad to see that they make them better now. I can’t tell and that’s a great thing! I laughed at you taking one for the team. The things we do for a good cuase. 🙂 High five to you! Totally can’t tell! That’s one huge selling point for sure. No one wants to talk about leakage! It’s really difficult to tell, I’m going to say #2! Wow, those pictures are tricky to tell apart! You are a brave lady to put yourself out there – but you look great. No clue! If I was to guess, I’d say #1 but, wouldn’t be surprised if I was wrong. I am sorry this is such an embarrasing issue for some women. I am glad there is a discreet solution and nothing can stop anyone do yoga! I am going to guess number 1. But either way you look great. You totally can’t tell. So glad there are good products out there to help deal with leakage.